Sodium bicarbonate is probably one of the most useful substances in the world; no wonder the pharmaceutical companies don’t want doctors or anyone else to know much about it. It is essential when treating cancer, kidney and other diseases. We do not have to fear bicarbonate intake. And in fact, people who live in areas of the world with high amounts of bicarbonate in their drinking waters have a striking decreased mortality rate and a decreased prevalence of disease. Sodium bicarbonate, though often used as a medicine, is unlike pharmaceutical compounds. It is a natural non-toxic substance that does not require clinical trials for an assessment of toxicity. Spring waters contain bicarbonate ions which are coupled mainly with sodium, potassium, calcium or magnesium ions. Many components of the modern western diet – meats, fish, dairy products, most grains, sugars, alcohol and caffeinated drinks (in fact, almost everything except vegetables, millet, most fruits and, as we have just seen, apple cider vinegar) – contribute to one’s body becoming too acidic. This in turn can open the door to a variety of problems, some of them (including arthritic complaints) potentially serious if this acidic condition persists for many years. This is because your body will attempt to compensate by retaining alkaline salts in the bloodstream to offset the increase of tissue acidity. Since your body can only tolerate a small imbalance in blood pH (the acid-alkali balance), it will rob alkaline components from other places – including your body’s precious alkaline reserves – in an effort to restore proper pH equilibrium. This can result in heartburn, digestive distress, stomach upset, fatigue and a multitude of other symptoms. Simple, inexpensive kitchen baking soda can fix this. Very useful in keeping the body healthily alkalized is half to one teaspoon a day of baking soda in water. Don’t take it with or within an hour of meals, though, as the stomach needs to retain its acidity in order to perform its digestive functions effectively. There also are interesting health benefits when you drink baking soda, which is alkaline, in water. Viruses and diseases such as colds, flu, cancer and even heart disease thrive in an acidic body, but cannot survive when your body is alkaline. The 2009 Journal of the American Society of Nephrology revealed a study of 134 patients with advanced kidney disease. Taking baking soda daily dramatically slowed down the progression of kidney disease, resulting in no need for dialysis. To increase your body’s pH, take 1/4 tsp. of baking soda dissolved in one-half glass of water on an empty stomach, once in the morning and again before bedtime. Acidity and alkalinity is measured by pH, which ranges from 0 to 14 with 7.0 being neutral; a pH above 7.0 is alkaline, and below 7.0 is acidic. Baking soda has the highest pH of 14. Create a healthy body by keeping your body’s pH between 7.1 and 7.5. If you’re an athlete, swallow sodium bicarbonate supplements with water to buffer lactic acid buildup and improve your exercise performance. Ingest 0.3 g of sodium bicarbonate per 2.2 lb. of body weight, one to two hours before the event, drinking plenty of water. Drink a glass of water with a half lemon or lime squeezed into it twice daily if you are unable to take baking soda and water. Lemons and limes are acidic but become alkaline in your body, raising your alkalinity almost as well as baking soda. You can purchase a pH testing kit for home use very cheaply, and if the water you usually drink is acidic (i.e. with a pH of less than 7.0) you could remedy this cheaply and easily by adding a pinch of baking soda to all the water you consume. When baking soda is added to bath water, sunburn sufferers often experience a notable reduction in pain. Place a cup (8 ounces) of baking soda under the running bath tap so it dissolves completely, and soak in a lukewarm tub for about half an hour. Such a bath will soothe the pain – and you won’t have to endure the stinging sensation of a shower. Adding baking soda to a hot bath at any time also helps wash acid wastes out of the body. Simple baking soda may also weaken the desire for a cigarette as well as reduce the desire for sugar and sweets. It’s used in kidney dialysis to reduce the level of acids in the bloodstream, and acts to prevent bacterial growth in food products. For general purposes of alkalinizing the body, quarter to half a teaspoon twice a day in water is usually enough. However, commercial antacid products only lessen symptoms of over-acidity by blocking the production of acid and can often produce unwanted side effects. They alter your body’s ability to absorb protein and calcium, which can then create the need for a calcium supplements to compensate. In addition to these household applications, sodium bicarbonate has several medicinal uses. Health Benefit of Baking Soda #1: Kidney Disease. Bicarbonate is an alkaline substance naturally produced in the body that buffers acids and helps keep pH in check. In people who have chronic kidney disease, which is most often caused by diabetes or hypertension, poorly functioning kidneys have a hard time removing acid from the body. This often results in a condition known as metabolic acidosis. Health Benefit of Baking Soda #2: Cancer. Studies have shown that dietary measures to boost bicarbonate levels can increase the pH of acidic tumors without upsetting the pH of the blood and healthy tissues. Although this hasn’t yet been studied in human clinical trials, animal models of humanbreast cancer show that oral sodium bicarbonate does indeed make tumors more alkaline and inhibit metastasis. Based on these studies—plus the fact that baking soda is safe and well tolerated—we’ve adopted this therapy at Whitaker Wellness as part of our overall nutritional and immune support protocol for patients who are dealing with cancer. At the clinic, we use 12 g (2 rounded teaspoons) of baking soda mixed in 2 cups water, along with a low-cal sweetener of your choice. (It’s quite salty tasting.) Sip this mixture over the course of an hour or two and repeat for a total of three times a day. Health Benefit of Baking Soda #3: Occasional Heartburn and Indigestion. Most over-the-counter antacids, such as Alka-Seltzer, Tums, and Rolaids, contain some form of bicarbonate. But a more cost-effective way to relieve occasional heartburn and indigestion is to stir half a teaspoon of baking soda into half a cup of water and drink it an hour or two after meals. Health Benefit of Baking Soda #4: Dermatological Conditions. British researchers found that adding one-half cup of baking soda to bathwater soothed itchiness and irritation in patients with psoriasis. And a paste made of baking soda mixed with a little water and dabbed on sunburn, insect bites, allergic rashes, and skin exposed to poison oak/ivy reduces discomfort. That same paste also makes a nice, gentle exfoliant. Health Benefit of Baking Soda #5: Natural Deodorant. Simply mix about a teaspoon of baking soda with enough water to create a milky liquid, and rub it on your feet and underarms. Health Benefit of Baking Soda #6: Oral Health. Baking soda is a popular ingredient in toothpastes and mouthwashes since it has been shown to enhance plaque removal. Of course, you could just dip your toothbrush in baking soda, but due to its abrasive qualities, it may wear down enamel over time. Therefore, I recommend going with the commercial products. Health Benefit of Baking Soda #7: Athletic Performance. When taken before intense exercise, sodium bicarbonate buffers the lactic acid that builds up in hard-working muscles, delays fatigue and enhances athletic performance. Topical use of baking soda is safe and nontoxic. Oral use is also safe, provided you do not exceed the recommended doses, as this could upset the body’s acid-base balance. Larger amounts can cause temporary nausea and diarrhea. Note: Although sodium bicarbonate contains quite a bit of sodium, it does not raise blood pressure.The hypertensive effect of salt (sodium chloride) comes from the combination of sodium and chloride. This baking soda article and this article are a couple of the best I’ve found on the pH factor in relationship to many disease-states. Harmful bacteria, virus, herpes (cold sores, etc.) and cancer, thrive in acidity. Stress, bad eating habits, pesticides, alcohol, pollution, etcetera, turn our bodies into “acid smorgasbords” — the perfect environment for destroying our bodies in a slow/painful manner. In addition, heartburn, diabetes, heart disease, arthritis, and more are well-known maladies related to acid blood levels. The bottom line … bacteria and virus will vacate your premises to find a more suitable acid-home as long as you keep your body in a state of alkalinity. By maintaining your drinking/baking soda water at 7.2 to 7.5 pH, you are greatly enhancing your body’s ability to prevent any of the above. Of all Things … Baking Soda? Studies in respected medical journals worldwide consistently support the use of a simple dirt-cheap product for reversing acidity — baking soda. Since there’s no money in baking soda for drug companies, its excluded from medical school curriculum and/or associated health training/education. As an interesting side-note, most odors we experience are bacteria related. A simple test is to sprinkle a bit of baking soda in your stinky shoes and/or under your smelly arm-pits — odor diminishes readily. Odor from areas of the body that stay wet and/or dark for awhile are a result of/or caused by bacteria and/or the symbiotic relationship it has with fungus. Fungus (vaginal candidiasis or candida, jock itch, athletes foot, etc.) is odor-producing. Cavities and bacteria (bad breath) are best-buddies, too. Sugar creates an acidic environment in the mouth, thus, a reason why dentists recommend avoiding sugar-related foods. Lactic acid is a well-known by-product of the exercising muscle. To a large degree, it is responsible for muscular soreness and pre-mature fatigue. Sport drinks do nothing to address the acid issue. In fact, they add to the acid problem due to the large amount of sugar ingested — sugar drinks are basically acid drinks. The same goes for fruit drinks (the actual sweet part of the fruit is replaced with sugar and/or high fructose corn syrup). It’s no wonder regular exercisers have a hard time recovering from injuries — the injury is surrounded by acid. Bananas, oranges, potatoes and melons are must-staples of athletes’ general diet due to their high potassium content. Yes, they contain sugar, however, it’s in a complex carbohydrate form (less inflammatory) that is a longer lasting fuel for the exercising muscle. They alkalize once consumed, however, baking soda water is a stronger and more direct alkalizing agent and may mean the difference between 1st and 2nd in an athletic event. This following method is easy, convenient, and you’re more likely to be consistent with it. If you drink distilled or reverse osmosis water daily as your main source of water (cleanest there is, but acidic), mix 3/4 to 1 teaspoon/gallon. Tap and bottled waters are not as acidic (but very dirty) so you may want to adjust them to a lower 1/2 teaspoon/gallon. You can make adjustments with pH papers below. 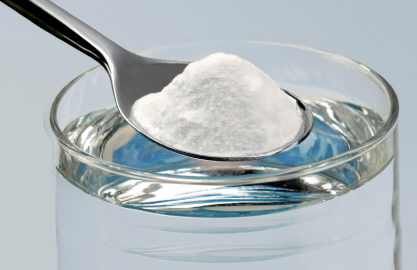 1/4 teaspoon of baking soda contains 300 mgs. (milligrams) of sodium — not much to be concerned about. Most of us typically consume 2,000-3,000 mgs. of salt (sodium chloride) daily. Studies show the relationship between sodium and potassium to be the high blood pressure culprit. Generally, where there is high sodium in populations, there is low potassium. Potassium rich foods generally cost more than sodium rich foods, thus, impoverished areas have a higher incidence of stroke and high blood pressure. The scientific literature shows that if potassium is increased and sodium stays the same, the incidence of blood pressure and strokes drop. A 2:1 ratio of potassium to sodium should be a strong consideration for anyone. Our government allows only 99 mgs. to be put in a daily dose where supplements are concerned. Raw fruits and vegetables are some of the best sources of potassium. This is one of the few areas where food provides more micro-nutrients than nutritional supplements. There are 2 easy ways to monitor your pH — urine and saliva. Whether you test your urine or saliva, the pH value of either varies throughout the day based on many variables (food, liquids, stress, nutritional supplement intake, etc.). Therefore, it is necessary to check it 4-5 times/day so you can establish an average. Personally, I have found the urine method to be the most accurate. If your average is still acidic (or, gets too alkaline) adjust the amount of baking soda accordingly. You can use pH paper/strips or a pH meter. I’ve always preferred the strips for convenience. 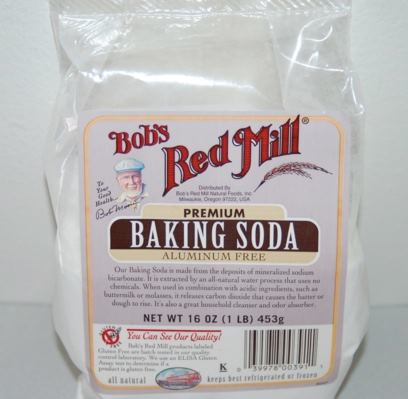 Be sure to purchase Aluminum-Free Baking Soda (Sodium Bicarbonate)!!! That’s Right – Blackstrap Molasses! hi, glad to read this. I have stomach ulcer and genital herpes,since 2001. Can baking soda kill the herpes virus so there will be no more recurrence (i have it 4-7x a year) . Pls. Help me how to use baking soda. Thanks a lot. Many, many thanks for this great post. One question: do you keep your baking soda in the fridge? A while ago i tried 1 teaspoon of Bi Carb in a large glass of water and i got really bad stomach cramps, anyone know why? I think there is a danger if you use too much. Try using 1/2 teaspoon. There is a warning on Arm & Hammer box to only use 1/2 teaspoon and make sure it’s completely disolved before ingesting or serious injury to your stomach can result. Also not to use this more than 7 times in 24 hrs. For people over 60 it should not be used more than 3 times in 24 hrs and do not use this maximum dosage for more than 2 weeks. I was told lemons were good for stopping cancer, and this baking soda will undo the lemon so what am I too believe? Never heard of that Henry… provide link with that info. I been doing this for years, and my mother & grandmother. All I can say is do the research yourself… be well. Is there something else I can do or will it just take some time to reach this area? a product with nano-size silver particles suspended in distilled water can be taken orally or put in a nebulizer (for sinus conditions) and inhaled. It is called silver biotics and is manufactured by a company in Utah called American Biotech labs. My sister cleared up her sinusitis with it. Good against bacteria and viruses. I AM TAKING THYROID MEDICINE IN THE MORNING AROUND 7 AM. WHEN I CAN TAKE SODIUM BICARBONATE AFTER TAKING MEDICINE . I suffer from rheumatoid arthritis, I have been introduced to this method of drinking water mixed with Soda bi-carbonate. I wish to know the ratio in tea spoonfull and a bottle of 500 ml and at what time and condition should I be drinking it. Do I drink the mixture on empty stomach and at how many times a day for a better result? I was wondering if baking will have any effect for gout.I am taking allopurinol as a preventative but I still get it once in a while. “Baking soda has the highest pH of 14.” This is not true, pH 14 would make it a super base and extremely harmful to the body, such as liquid drain cleaner. Baking soda has a ph around 8. Unless that was just a bad mistake I would think this article very unreliable. Is sodium bicarbonate recommended after a heavy meal? My thinking is after a heavy meal our stomach will contain abnormal quantities of acid. So Sodium bicarbonate will neutralize some acid and maintains the stomach at optimum acidity which was just sufficient for effective action of enzymes like pepsin. Right? I have been using Bi Carb Soda for many years for indigestion. Now that I am on medication for to much acid I don’t use it as much.. But I remember my Grandfather told me always have a half tea spoon of Bi Carb with a little water everyday its good for you..So after reading all of this I believe he may have been correct.. This seems a great site. I have hypothyroidism and take 150mcg of thyroxine in tablet form daily. Is it safe for me to take bicarbonate of soda? This was recommended (bicarbonate of soda) to me as I have candida. Your thoughts and suggestions would be really appreciated. fact take useful information concerning my study and knowledge. Hi SB is helping my friend who has foliculitis. His skin and scalp got so much better after using a paste mixing SB with a bit of warm wate and applied locally only twice. hello. great info on your web site. I am a little confused however regarding your comment on arm and hammer baking soda. The box says nothing about aluminum, and the ingredient list says %100 pure sodium bicarbonate. Upon reading this, I called arm and hammer who assured me their product contained no aluminum. I have always been wary of big companies, but I can’t imagine them being that deceptive. This makes me wonder where you got your info about their product containing aluminum? HI, i have problems with high acidity after eating, i have read and tried soda with vinegar+ sugar mixture, and in few minutes all simptoms are gone, put half teaspoon of baking soda +1 teaspoon of sugar in 1dcl(half cup) of water, then add 1 tbls of vineger(preff apple vinegar) mix all together, you will see small reaction after you mix it, then drink, all problems with stomac will vanish within 5 minutes.! I have hyper acidity and also blood presure is high. Can use baking soda or packd soda water? I have vaginal burning and bacterial over growth should I drink baking soda water? vry nice, highly informative… just by baking soda these miracles can be made means wonderful. we indians whenever we have heavy foods(vegan) also creates bloating sensations. during that time we take a pinch of soda to a lime water will releases the gas. but we never known about the PH level will be balanced and excess of acid leads to all sorts of diseases. thanks sir.